If the card author provides us with basic stats, homeworld, etc., then I think we could get that card information out there. There just hasn't been much demand for it. While we are on the subject of cards, we should have news soon. Noticing that the Hoplitrons and Dashi are very close to passing or failing as well. Shaitahn gives a boost to Valkrill's undead faction where they most need it -- board control. He also fits in a different role, the suicidal striker, due to his (her?) ability to come back from the grave. Theoryscaping Shaitahn is difficult at best. In terms of raw stats he's pretty solid, though not 120pts worth of solid. He's as strong defensively as Q10, but being a melee figure he is much less likely to control height advantage. A single attack of 3 doesn't seem like much, but Soul Weapon helps that, which in most cases is a little better than a 4th attack dice. He can hold his own in a fight, but not amazingly so, even considering bonding. Most of Shaitahn's value is in his other two abilities, Rejected By Death and Undead March. Undead March is easier of the two to quantify, being somewhat similar to Sir Gilbert's Jandar's Dispatch. Undead March is better than Jandar's Dispatch in some ways, namely consistency and being able to move more figures with the bonus movement than Death Knights or Thralls can move on their own turns. This movement boost can especially help the Death Knights, who can then take a turn due to bonding, allowing them to move up to six Death Knights in a single order marker or giving a pair of Death Knights 9-space movements plus moving two more four spaces. This gives them a lot more board control than they normally have. The fact that this is done instead of taking a turn with Shaitahn really hurts, though, especially with his suicidal striker uses. Rejected By Death is somewhat difficult to quantify, as the one example we have, Thanos, is a crazy-strong figure that people build armies around. Shaitahn is a respectable fighter, but he's no Thanos. Not strong enough to build an army around, but the two army builds Shaitahn helps most, Death Knights and Thralls, have multi-turn powers (Unholy Bonding and Mindless Pack) that increases the odds of RBD bringing him back. Very nice natural synergy, and in my testing Shaitahn was almost always able to return to the board if killed early. Is Shaitahn's cost justified? Hard to put a price on wildly random powers like Rejected By Death, but I'd say the price is at least in the ballpark from a theoryscaping perspective. How well does he play at that cost? See the Playability section. An Undead Leader for the Death Knights? Nothing wrong with the theme there. Soul Weapons, Undead March, all good stuff. Rejected By Death is an interesting pull from Marvelscape and has a different thematic feel on an undead hero than it has for Thanos and his comic book history. I rather like the name Shaitahn too, given its origin. I like the reuse of Rejected By Death. Despite not having the same meaning as it does for Thanos, it fits well for an undead hero. Undead March is an interesting twist on Jandar's Dispatch. The combination of the two on the same hero makes for some tough early-game choices. The D&D Lords of Madness Skeleton figures are around. Not a lot of them, but it doesn't take much looking to find a few. Do the Death Knights of Valkrill need a boost? Many people think so. The C3V thought so when they created the Skull Demon. While two-figure squads tend to have it rough due to a low number of attacks per order marker, the Death Knights' lack of board control is worse. With bonding they move three figures per order marker and rely on their strong 5 defense to hold their ground. Well, as anyone who played with them can tell you, 5 defense does not stand up nearly as long as you would hope. Shaitahn addresses this weakness in multiple ways: with a movement boost, as a front-line assault unit, and the ability to reappear on the front lines. First, the movement boost. Undead March can be used to move up a whole army of Death Knights; this is great for maps with elevations in the middle of the board. This can also be used to give a threat range of 10 (4 move + 5 move + 1 range) to two DKs. This speed boost can catch an opponent off guard while also managing to move up a couple more for a followup if needed. Shaitahn's other use, as a suicidal striker, is also useful as a board control mechanism, of a sort. Since it does not particularly matter if Shaitahn dies early, you can rush him headlong directly into the enemy. Your opponent can try to ignore him, but he has just enough punch to make that difficult or at least irritating. Any attacks spent at Shaitahn are attacks not spent on Death Knights, hopefully giving them some time to get where they need to go. After Shaitahn dies, as long as you have another bonding option, you get two Rejected By Death rolls per order marker. When Shaitahn comes back he's almost always right on the front lines, ready to start hacking away. Interestingly, these two uses directly compete with each other due to the fact that Undead March is used instead of Shaitahn's turn. Each use of Undead March is another turn that Shaitahn is not charging across the battlefield or hacking away at your opponent. Even a turn or two of Marching can really slow down a suicide charge. While I generally do not like designs that seem to contradict themselves, I found the choice of playstyles compelling. More than that -- I found it to be Shaitahn's greatest strength. A clever player will change up their strategy based on the map and the opposing army. Sometimes a suicide attack is the way to go, other times it's better to start off Marching. Another army that Shaitahn works well in is a Nicholas Esenwein/Thrall army, particularly in heroes-only matches. Shaitahn can be used for an early Undead March, which moves more figures and is more predictable than Mindless Pack, or rush forward and swing away until he dies. Like with the Death Knights, the Thralls usually get multiple turns per order marker, thus giving Shaitahn greatly improved chances of coming back. Rejected By Death is a swingy power. That's obvious, and nothing new to Heroscape. It's also a power that's better the longer the game goes. In large-point games he will probably come back multiple times. In small-point games he's lucky to come back at all. Most of my testing focused on the commonly-used standard of ~500pt armies. At that point total I feel he works well and is worth his points, boosting the Death Knights to a more competitve level. Top tier? No. Respectable though. I don't recommend using him in 300pt armies or less. I do recommend using him in big games (and using him, and using him, ...). Shaitahn gives a solid boost to the Death Knights of Valkrill, whether played for his movement boost or as a suicidal striker. The ability to do either effectively is his best asset, and makes for some interesting early game decisions. Will Shaitahn give Death Knights the boost they need to stomp A-ranked armies? No, but with him they can challenge some solid builds. A boost to the Thralls is nice to see too. Overall I had fun playing him, and would be more inclined to draft Death Knights if Shaitahn was in the drafting pool. I vote to induct Shaitahn into the SoV. Last edited by Scytale; May 6th, 2013 at 04:44 PM. I just saw that Gor'Vath was listed twice in the 2nd post here. (error? ^^). Also, I'm working about the superfrog's demand. Gor'Vath was nominated twice, and the two versions were slightly different. Both times, the custom was accepted for review but not inducted. Balance- Bronzewielder walks a fine line between commander and warrior, his two powers allowing him to move his own troops in reaction to an opponent’s actions, or put the hurt down on any opponent’s figures that make the mistake of clumping when he’s near, particularly high-cost squad figures. However, he is limited by his survivability. While his high life will keep him alive for a limited amount of time, the defense of 3 keeps his cost in check, forcing a player to use Axegrinders in order to ensure his survival against hordes or very big targets. Considering the value of order marker tricks, coupled with a semi-reliable D20 power and relatively reliable stats, rolled together in a nice little bonding package, 140 points seemed right after playtesting was concluded, not a significant change from what I had originally intended. Playability- The powers are relatively simple. Tactical Repositioning might need a second glance, but it’s little more than an altered Scatter taking place at a different time in the turn process. The master stats are appropriate for the miniature, and for the design. Unlike most previous dwarf heroes, the mini is clearly lightly armored, thus contributing to both his move of 6 and defense of 3. His attack of 4 is on par with other dwarf heroes, and the life of 7 makes up for his less-than-stellar defense. As a small figure, Grommel Bronzewielder goes on a typical HeroScape single-hex base. As a dwarf, garbed in red and gold, hefting a war-hammer, I’d say he’s visually distinctive from other units, easily. The point value is slightly above previous dwarf heroes, but I think he deserves it, given his abilities to move his men and inflict heavy damage on a decent D20 roll. Creativity- Bronzewielder brings in a new strain of dwarf hero, deviating somewhat from the trend of dwarves possessing some sort of defensive special power. Instead, he swaps it out for a nice way to mess around with your opponents plans by moving your dwarves out of danger (or into it). He can order his men to tie down a dangerous ranged figure, back away from a raging melee beat-stick, or simply snag a glyph. While he is the third dwarf hero to possess a D20 power, it is entirely distinct from the previous two, Hide in Darkness and Commander’s Strike. 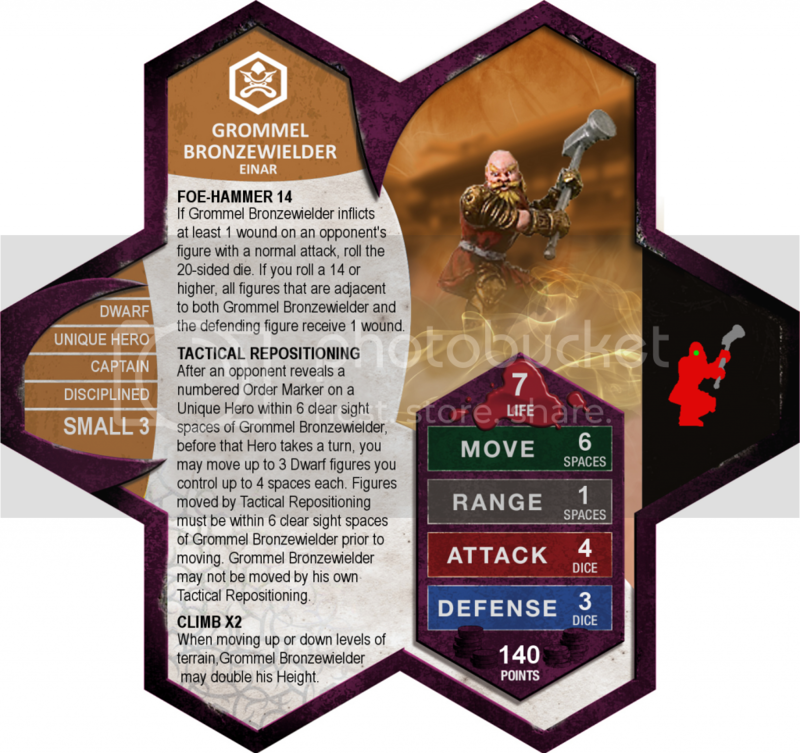 As a mixture of commander and melee fighter that can bring the hurt or reorganize the troops, Grommel Bronzewielder brings a whole new type of unit to Einar’s forces, not only in his powers, but in that he is the first dwarf to reach the imperialist armies. Small note here, Bronzewielder’s first name “Grommel” is derived from the respected WWII Field Marshal Erwin Rommel, known as the Desert Fox for his tactical prowess, while “Bronzewielder” is a simple play on the color of his armor. Theme- As a species already being developed in ‘Scape, Grommel’s not breaking new ground on that front. Some eyebrows might be raised by Einar summoning a dwarf, but with the Aquilla monopoly on the species officially broken by C3V, and Grommel’s powers clearly illustrating a knowledge of battlefield tactics (not to mention the red and gold color scheme, very Einar/Roman), Einar is the perfect fit. Cool Stuff Inc has 12 in stock, Strikezoneonline has another 13 in stock, while Miniature Market has 79 in stock, plus a promo repaint for a bit more money (5 dollars rather than the 2 the mini typically goes for). The promo has another 81 in stock. Last edited by Son of Arathorn; November 9th, 2012 at 04:35 PM. Reason: New card, thanks awesomeunleashed. I'm concerned about him being a Small 3 dwarf without Climb x2. Mogrimm and Ulfrid are both Medium 4 to get around that limitation. As for the rest, I am still thinking it over, but I like this unit. I have a nagging suspicion about Tactical Repositioning, but I like the rest. I vote to review Grommel Bronzewielder. He does have a pretty big hammer (laughing inside thinking about Dr. Horrible's Sing-a-Long Blog right now) that would slow him down. Foe-Hammer 14 could do some massive damage if ou successfully got it on a double based figure. Imagining Grimnack surrounded by Heavies right now getting decimated by that. 140 points is pretty steep for dwarf though, so mabye the price takes that into consideration. You mis-read Foe Hammer. It's like Sweeping Sword, the maximum amount of figures that it can affect is 2. Last edited by awesomeunleashed; November 9th, 2012 at 12:31 PM. Reason: Ninja'd!! !